Jhené Aiko is one of R&B’s hidden gems. She’s been in the game since B2K was a thing—she was featured on the group’s 2002 sophomore effort, Pandemonium!—and her smooth, sultry voice is only outshined by her brilliantly casual songwriting style. After enduring the long, tumultuous ordeal that is being a talented unknown signed at a young age, she branched out and released a beautifully crafted mixtape, Sailing Soul(s), independently via her website, and the songstress immediately started to gain national recognition. Now, as an artist on Def Jam signed to No I.D.’s Atrium Records imprint, Jhené is finally poised to make her mark on music. Fresh off her stellar contribution to Drake’s Nothing Was The Same album on a record entitled “From Time”, Jhené is ready to prep the release of her solo debut, Souled Out. An early offering from the album's proceeding EP, Sail Out, is the Childish Gambino-assisted “Bed Peace”, and the song is as easygoing as it gets. Refreshingly soothing and exceptionally carefree, the cut finds the singer in a southern California groove, and Gambino provides a little something extra to the already fantastic record. “What I am trying to say is, the love is ours to make, so we should make it,” she proposes. A wonderful sentiment, indeed. 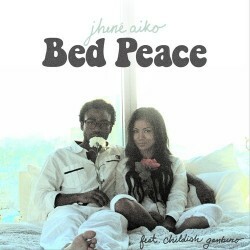 Stream “Bed Peace” below and be on the lookout for Jhené Aiko’s Def Jam debut, Souled Out, and its corresponding EP, Sail Out, both due out before the end of the year. Love this, such a chill beat. So happy to discover Earmilk!